For other uses, see Ocean (disambiguation). Not to be confused with Sea or World Ocean. An ocean (from Ancient Greek Ὠκεανός, transc. Okeanós) is a body of water that composes much of a planet's hydrosphere. On Earth, an ocean is one of the major conventional divisions of the World Ocean. These are, in descending order by area, the Pacific, Atlantic, Indian, Southern (Antarctic), and Arctic Oceans. The word "ocean" is often used interchangeably with "sea" in American English. Strictly speaking, a sea is a body of water (generally a division of the world ocean) partly or fully enclosed by land, though "the sea" refers also to the oceans. Saline water covers approximately 361,000,000 km2 (139,000,000 sq mi) and is customarily divided into several principal oceans and smaller seas, with the ocean covering approximately 71% of Earth's surface and 90% of the Earth's biosphere. The ocean contains 97% of Earth's water, and oceanographers have stated that less than 5% of the World Ocean has been explored. The total volume is approximately 1.35 billion cubic kilometers (320 million cu mi) with an average depth of nearly 3,700 meters (12,100 ft). As the world ocean is the principal component of Earth's hydrosphere, it is integral to life, forms part of the carbon cycle, and influences climate and weather patterns. The World Ocean is the habitat of 230,000 known species, but because much of it is unexplored, the number of species that exist in the ocean is much larger, possibly over two million. The origin of Earth's oceans is unknown; oceans are thought to have formed in the Hadean eon and may have been the impetus for the emergence of life. Extraterrestrial oceans may be composed of water or other elements and compounds. The only confirmed large stable bodies of extraterrestrial surface liquids are the lakes of Titan, although there is evidence for the existence of oceans elsewhere in the Solar System. Early in their geologic histories, Mars and Venus are theorized to have had large water oceans. The Mars ocean hypothesis suggests that nearly a third of the surface of Mars was once covered by water, and a runaway greenhouse effect may have boiled away the global ocean of Venus. Compounds such as salts and ammonia dissolved in water lower its freezing point so that water might exist in large quantities in extraterrestrial environments as brine or convecting ice. Unconfirmed oceans are speculated beneath the surface of many dwarf planets and natural satellites; notably, the ocean of Europa is estimated to have over twice the water volume of Earth. The Solar System's giant planets are also thought to have liquid atmospheric layers of yet to be confirmed compositions. Oceans may also exist on exoplanets and exomoons, including surface oceans of liquid water within a circumstellar habitable zone. Ocean planets are a hypothetical type of planet with a surface completely covered with liquid. The word ocean comes from the figure in classical antiquity, Oceanus (/oʊˈsiːənəs/; Greek: Ὠκεανός Ōkeanós, pronounced [ɔːkeanós]), the elder of the Titans in classical Greek mythology, believed by the ancient Greeks and Romans to be the divine personification of the sea, an enormous river encircling the world. The concept of Ōkeanós has an Indo-European connection. Greek Ōkeanós has been compared to the Vedic epithet ā-śáyāna-, predicated of the dragon Vṛtra-, who captured the cows/rivers. Related to this notion, the Okeanos is represented with a dragon-tail on some early Greek vases. Though generally described as several separate oceans, the global, interconnected body of salt water is sometimes referred to as the World Ocean or global ocean. The concept of a continuous body of water with relatively free interchange among its parts is of fundamental importance to oceanography. 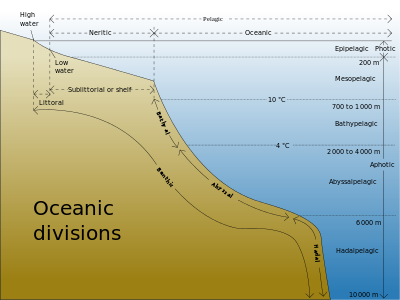 The major oceanic divisions – listed below in descending order of area and volume – are defined in part by the continents, various archipelagos, and other criteria. NB: Volume, area, and average depth figures include NOAA ETOPO1 figures for marginal South China Sea. Sources: Encyclopedia of Earth, International Hydrographic Organization, Regional Oceanography: an Introduction (Tomczak, 2005), Encyclopædia Britannica, and the International Telecommunication Union. Oceans are fringed by smaller, adjoining bodies of water such as seas, gulfs, bays, bights, and straits. Three main types of plate boundaries. The mid-ocean ridges of the world are connected and form a single global mid-oceanic ridge system that is part of every ocean and the longest mountain range in the world. The continuous mountain range is 65,000 km (40,000 mi) long (several times longer than the Andes, the longest continental mountain range). The total mass of the hydrosphere is about 1.4 quintillion metric tons (7018140000000000000♠1.4×1018 long tons or 7018150000000000000♠1.5×1018 short tons), which is about 0.023% of Earth's total mass. Less than 3% is freshwater; the rest is saltwater, almost all of which is in the ocean. The area of the World Ocean is about 361.9 million square kilometers (139.7 million square miles), which covers about 70.9% of Earth's surface, and its volume is approximately 1.335 billion cubic kilometers (320.3 million cubic miles). This can be thought of as a cube of water with an edge length of 1,101 kilometers (684 mi). Its average depth is about 3,688 meters (12,100 ft), and its maximum depth is 10,994 meters (6.831 mi) at the Mariana Trench. Nearly half of the world's marine waters are over 3,000 meters (9,800 ft) deep. The vast expanses of deep ocean (anything below 200 meters or 660 feet) cover about 66% of Earth's surface. This does not include seas not connected to the World Ocean, such as the Caspian Sea. The bluish ocean color is a composite of several contributing agents. Prominent contributors include dissolved organic matter and chlorophyll. Mariners and other seafarers have reported that the ocean often emits a visible glow which extends for miles at night. In 2005, scientists announced that for the first time, they had obtained photographic evidence of this glow. It is most likely caused by bioluminescence. Oceanographers divide the ocean into different vertical zones defined by physical and biological conditions. The pelagic zone includes all open ocean regions, and can be divided into further regions categorized by depth and light abundance. The photic zone includes the oceans from the surface to a depth of 200 m; it is the region where photosynthesis can occur and is, therefore, the most biodiverse. Because plants require photosynthesis, life found deeper than the photic zone must either rely on material sinking from above (see marine snow) or find another energy source. Hydrothermal vents are the primary source of energy in what is known as the aphotic zone (depths exceeding 200 m). The pelagic part of the photic zone is known as the epipelagic. The pelagic part of the aphotic zone can be further divided into vertical regions according to temperature. The mesopelagic is the uppermost region. Its lowermost boundary is at a thermocline of 12 °C (54 °F), which, in the tropics generally lies at 700–1,000 meters (2,300–3,300 ft). Next is the bathypelagic lying between 10 and 4 °C (50 and 39 °F), typically between 700–1,000 meters (2,300–3,300 ft) and 2,000–4,000 meters (6,600–13,100 ft), lying along the top of the abyssal plain is the abyssopelagic, whose lower boundary lies at about 6,000 meters (20,000 ft). The last zone includes the deep oceanic trench, and is known as the hadalpelagic. This lies between 6,000–11,000 meters (20,000–36,000 ft) and is the deepest oceanic zone. The benthic zones are aphotic and correspond to the three deepest zones of the deep-sea. The bathyal zone covers the continental slope down to about 4,000 meters (13,000 ft). The abyssal zone covers the abyssal plains between 4,000 and 6,000 m. Lastly, the hadal zone corresponds to the hadalpelagic zone, which is found in oceanic trenches. The pelagic zone can be further subdivided into two subregions: the neritic zone and the oceanic zone. The neritic zone encompasses the water mass directly above the continental shelves whereas the oceanic zone includes all the completely open water. In contrast, the littoral zone covers the region between low and high tide and represents the transitional area between marine and terrestrial conditions. It is also known as the intertidal zone because it is the area where tide level affects the conditions of the region. If a zone undergoes dramatic changes in temperature with depth, it contains a thermocline. The tropical thermocline is typically deeper than the thermocline at higher latitudes. Polar waters, which receive relatively little solar energy, are not stratified by temperature and generally lack a thermocline because surface water at polar latitudes are nearly as cold as water at greater depths. Below the thermocline, water is very cold, ranging from −1 °C to 3 °C. Because this deep and cold layer contains the bulk of ocean water, the average temperature of the world ocean is 3.9 °C. If a zone undergoes dramatic changes in salinity with depth, it contains a halocline. If a zone undergoes a strong, vertical chemistry gradient with depth, it contains a chemocline. The halocline often coincides with the thermocline, and the combination produces a pronounced pycnocline. The deepest point in the ocean is the Mariana Trench, located in the Pacific Ocean near the Northern Mariana Islands. Its maximum depth has been estimated to be 10,971 meters (35,994 ft) (plus or minus 11 meters; see the Mariana Trench article for discussion of the various estimates of the maximum depth.) The British naval vessel Challenger II surveyed the trench in 1951 and named the deepest part of the trench the "Challenger Deep". In 1960, the Trieste successfully reached the bottom of the trench, manned by a crew of two men. Oceanic surface currents (U.S. Army, 1943). Amphidromic points showing the direction of tides per incrementation periods along with resonating directions of wavelength movements. Oceanic maritime currents have different origins. Tidal currents are in phase with the tide, hence are quasiperiodic; they may form various knots in certain places,[clarification needed] most notably around headlands. Non-periodic currents have for origin the waves, wind and different densities. The wind and waves create surface currents (designated as “drift currents”). These currents can decompose in one quasi-permanent current (which varies within the hourly scale) and one movement of Stokes drift under the effect of rapid waves movement (at the echelon of a couple of seconds).). The quasi-permanent current is accelerated by the breaking of waves, and in a lesser governing effect, by the friction of the wind on the surface. This acceleration of the current takes place in the direction of waves and dominant wind. Accordingly, when the sea depth increases, the rotation of the earth changes the direction of currents in proportion with the increase of depth, while friction lowers their speed. At a certain sea depth, the current changes direction and is seen inverted in the opposite direction with current speed becoming null: known as the Ekman spiral. The influence of these currents is mainly experienced at the mixed layer of the ocean surface, often from 400 to 800 meters of maximum depth. These currents can considerably alter, change and are dependent on the various yearly seasons. If the mixed layer is less thick (10 to 20 meters), the quasi-permanent current at the surface adopts an extreme oblique direction in relation to the direction of the wind, becoming virtually homogeneous, until the Thermocline. In the deep however, maritime currents are caused by the temperature gradients and the salinity between water density masses. In littoral zones, breaking waves are so intense and the depth measurement so low, that maritime currents reach often 1 to 2 knots. Ocean currents greatly affect Earth's climate by transferring heat from the tropics to the polar regions. Transferring warm or cold air and precipitation to coastal regions, winds may carry them inland. Surface heat and freshwater fluxes create global density gradients that drive the thermohaline circulation part of large-scale ocean circulation. It plays an important role in supplying heat to the polar regions, and thus in sea ice regulation. Changes in the thermohaline circulation are thought to have significant impacts on Earth's energy budget. In so far as the thermohaline circulation governs the rate at which deep waters reach the surface, it may also significantly influence atmospheric carbon dioxide concentrations. For a discussion of the possibilities of changes to the thermohaline circulation under global warming, see shutdown of thermohaline circulation. The Antarctic Circumpolar Current encircles that continent, influencing the area's climate and connecting currents in several oceans. One of the most dramatic forms of weather occurs over the oceans: tropical cyclones (also called "typhoons" and "hurricanes" depending upon where the system forms). The ocean has a significant effect on the biosphere. Oceanic evaporation, as a phase of the water cycle, is the source of most rainfall, and ocean temperatures determine climate and wind patterns that affect life on land. Life within the ocean evolved 3 billion years prior to life on land. Both the depth and the distance from shore strongly influence the biodiversity of the plants and animals present in each region. Algae : algae is a "catch-all" term to include many photosynthetic, single-celled eukaryotes, such as green algae, diatoms, and dinoflagellates, but also multicellular algae, such as some red algae (including organisms like Pyropia, which is the source of the edible nori seaweed), and brown algae (including organisms like kelp). Animals : most animal phyla have species that inhabit the ocean, including many that are only found in marine environments such as sponges, Cnidaria (such as corals and jellyfish), comb jellies, Brachiopods, and Echinoderms (such as sea urchins and sea stars). Many other familiar animal groups primarily live in the ocean, including cephalopods (includes octopus and squid), crustaceans (includes lobsters, crabs, and shrimp), fish, sharks, cetaceans (includes whales, dolphins, and porpoises). In addition, many land animals have adapted to living a major part of their life on the oceans. For instance, seabirds are a diverse group of birds that have adapted to a life mainly on the oceans. They feed on marine animals and spend most of their lifetime on water, many only going on land for breeding. Other birds that have adapted to oceans as their living space are penguins, seagulls and pelicans. Seven species of turtles, the sea turtles, also spend most of their time in the oceans. A zone of rapid salinity increase with depth is called a halocline. The temperature of maximum density of seawater decreases as its salt content increases. Freezing temperature of water decreases with salinity, and boiling temperature of water increases with salinity. Typical seawater freezes at around −2 °C at atmospheric pressure. If precipitation exceeds evaporation, as is the case in polar and temperate regions, salinity will be lower. If evaporation exceeds precipitation, as is the case in tropical regions, salinity will be higher. Thus, oceanic waters in polar regions have lower salinity content than oceanic waters in temperate and tropical regions. Many of the world's goods are moved by ship between the world's seaports. Oceans are also the major supply source for the fishing industry. Some of the major harvests are shrimp, fish, crabs, and lobster. The motions of the ocean surface, known as undulations or waves, are the partial and alternate rising and falling of the ocean surface. The series of mechanical waves that propagate along the interface between water and air is called swell. Artist's conception of subsurface ocean of Enceladus confirmed April 3, 2014. Two models for the composition of Europa predict a large subsurface ocean of liquid water. Similar models have been proposed for other celestial bodies in the Solar System. Although Earth is the only known planet with large stable bodies of liquid water on its surface and the only one in the Solar System, other celestial bodies are thought to have large oceans. The gas giants, Jupiter and Saturn, are thought to lack surfaces and instead have a stratum of liquid hydrogen; however their planetary geology is not well understood. The possibility of the ice giants Uranus and Neptune having hot, highly compressed, supercritical water under their thick atmospheres has been hypothesised. Although their composition is still not fully understood, a 2006 study by Wiktorowicz and Ingersall ruled out the possibility of such a water "ocean" existing on Neptune, though some studies have suggested that exotic oceans of liquid diamond are possible. The Mars ocean hypothesis suggests that nearly a third of the surface of Mars was once covered by water, though the water on Mars is no longer oceanic (much of it residing in the ice caps). The possibility continues to be studied along with reasons for their apparent disappearance. Astronomers think that Venus had liquid water and perhaps oceans in its very early history. If they existed, all later vanished via resurfacing. A global layer of liquid water thick enough to decouple the crust from the mantle is thought to be present on the natural satellites Titan, Europa, Enceladus and, with less certainty, Callisto, Ganymede and Triton. A magma ocean is thought to be present on Io. Geysers have been found on Saturn's moon Enceladus, possibly originating from an ocean about 10 kilometers (6.2 mi) beneath the surface ice shell. 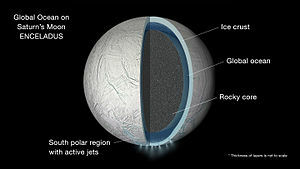 Other icy moons may also have internal oceans, or may once have had internal oceans that have now frozen. Large bodies of liquid hydrocarbons are thought to be present on the surface of Titan, although they are not large enough to be considered oceans and are sometimes referred to as lakes or seas. The Cassini–Huygens space mission initially discovered only what appeared to be dry lakebeds and empty river channels, suggesting that Titan had lost what surface liquids it might have had. Later flybys of Titan provided radar and infrared images that showed a series of hydrocarbon lakes in the colder polar regions. 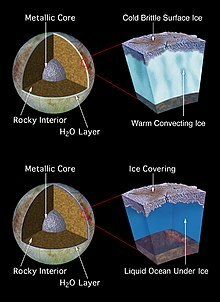 Titan is thought to have a subsurface liquid-water ocean under the ice in addition to the hydrocarbon mix that forms atop its outer crust. Ceres appears to be differentiated into a rocky core and icy mantle and may harbour a liquid-water ocean under its surface. Not enough is known of the larger trans-Neptunian objects to determine whether they are differentiated bodies capable of supporting oceans, although models of radioactive decay suggest that Pluto, Eris, Sedna, and Orcus have oceans beneath solid icy crusts approximately 100 to 180 km thick. Some planets and natural satellites outside the Solar System are likely to have oceans, including possible water ocean planets similar to Earth in the habitable zone or "liquid-water belt". The detection of oceans, even through the spectroscopy method, however is likely extremely difficult and inconclusive. Theoretical models have been used to predict with high probability that GJ 1214 b, detected by transit, is composed of exotic form of ice VII, making up 75% of its mass, making it an ocean planet. Other possible candidates are merely speculated based on their mass and position in the habitable zone include planet though little is actually known of their composition. Some scientists speculate Kepler-22b may be an "ocean-like" planet. Models have been proposed for Gliese 581 d that could include surface oceans. Gliese 436 b is speculated to have an ocean of "hot ice". Exomoons orbiting planets, particularly gas giants within their parent star's habitable zone may theoretically have surface oceans. Terrestrial planets will acquire water during their accretion, some of which will be buried in the magma ocean but most of it will go into a steam atmosphere, and when the atmosphere cools it will collapse on to the surface forming an ocean. There will also be outgassing of water from the mantle as the magma solidifies—this will happen even for planets with a low percentage of their mass composed of water, so "super-Earth exoplanets may be expected to commonly produce water oceans within tens to hundreds of millions of years of their last major accretionary impact." Oceans, seas, lakes and other bodies of liquids can be composed of liquids other than water, for example the hydrocarbon lakes on Titan. The possibility of seas of nitrogen on Triton was also considered but ruled out. There is evidence that the icy surfaces of the moons Ganymede, Callisto, Europa, Titan and Enceladus are shells floating on oceans of very dense liquid water or water–ammonia. Earth is often called the ocean planet because it is 70% covered in water. Extrasolar terrestrial planets that are extremely close to their parent star will be tidally locked and so one half of the planet will be a magma ocean. It is also possible that terrestrial planets had magma oceans at some point during their formation as a result of giant impacts. Hot Neptunes close to their star could lose their atmospheres via hydrodynamic escape, leaving behind their cores with various liquids on the surface. Where there are suitable temperatures and pressures, volatile chemicals that might exist as liquids in abundant quantities on planets include ammonia, argon, carbon disulfide, ethane, hydrazine, hydrogen, hydrogen cyanide, hydrogen sulfide, methane, neon, nitrogen, nitric oxide, phosphine, silane, sulfuric acid, and water. Supercritical fluids, although not liquids, do share various properties with liquids. Underneath the thick atmospheres of the planets Uranus and Neptune, it is expected that these planets are composed of oceans of hot high-density fluid mixtures of water, ammonia and other volatiles. The gaseous outer layers of Jupiter and Saturn transition smoothly into oceans of supercritical hydrogen. The atmosphere of Venus is 96.5% carbon dioxide, which is a supercritical fluid at its surface. ^ "Ὠκεανός". Perseus Digital Library. Retrieved May 17, 2012. ^ "WordNet Search — ocean". Princeton University. Retrieved February 21, 2012. ^ "ocean, n". Oxford English Dictionary. Retrieved February 5, 2012. ^ "ocean". Merriam-Webster. Retrieved February 6, 2012. ^ "WordNet Search — sea". Princeton University. Retrieved February 21, 2012. ^ a b c "NOAA – National Oceanic and Atmospheric Administration – Ocean". Noaa.gov. Retrieved 2012-11-08. ^ Qadri, Syed (2003). "Volume of Earth's Oceans". The Physics Factbook. Retrieved 2007-06-07. ^ Charette, Matthew; Smith, Walter H. F. (2010). "The volume of Earth's ocean". Oceanography. 23 (2): 112–114. doi:10.5670/oceanog.2010.51. Retrieved 27 September 2012. ^ Drogin, Bob (August 2, 2009). "Mapping an ocean of species". Los Angeles Times. Retrieved August 18, 2009. ^ "Titan Likely To Have Huge Underground Ocean | Mind Blowing Science". Mindblowingscience.com. Retrieved 2012-11-08. ^ a b "Ocean-bearing Planets: Looking For Extraterrestrial Life In All The Right Places". Sciencedaily.com. Retrieved 2012-11-08. ^ Matasović, Ranko, A Reader in Comparative Indo-European Religion Zagreb: Univ of Zagreb, 2016. p. 20. ^ "Ocean". Sciencedaily.com. Retrieved 2012-11-08. ^ Spilhaus, Athelstan F. (July 1942). "Maps of the whole world ocean". Geographical Review. 32 (3): 431–5. doi:10.2307/210385. JSTOR 210385. ^ "CIA World Factbook". CIA. Retrieved 2015-04-05. ^ a b "Pacific Ocean". Encyclopedia of Earth. Retrieved 2015-03-07. ^ a b "Atlantic Ocean". Encyclopedia of Earth. Retrieved 2015-03-07. ^ a b "Indian Ocean". Encyclopedia of Earth. Retrieved 2015-03-07. ^ a b "Southern Ocean". Encyclopedia of Earth. Retrieved 2015-03-10. ^ a b Tomczak, Matthias; Godfrey, J. Stuart (2003). Regional Oceanography: an Introduction (2 ed.). Delhi: Daya Publishing House. ISBN 978-81-7035-306-5. ^ a b "'Arctic Ocean' – Encyclopædia Britannica". Retrieved 2012-07-02. As an approximation, the Arctic Ocean may be regarded as an estuary of the Atlantic Ocean. ^ a b "Arctic Ocean". Encyclopedia of Earth. Retrieved 2015-03-07. ^ a b "Recommendation ITU-R RS.1624: Sharing between the Earth exploration-satellite (passive) and airborne altimeters in the aeronautical radionavigation service in the band 4 200–4 400 MHz (Question ITU-R 229/7)" (PDF). ITU Radiotelecommunication Sector (ITU-R). Retrieved 2015-04-05. The oceans occupy about 3.35×108 km2 of area. There are 377412 km of oceanic coastlines in the world. ^ "What is the longest mountain range on earth?". Ocean Facts. NOAA. Retrieved 17 October 2014. ^ "Scientists map Mariana Trench, deepest known section of ocean in the world". The Telegraph. Telegraph Media Group. 7 December 2011. Retrieved 23 March 2012. ^ Drazen, Jeffrey C. "Deep-Sea Fishes". School of Ocean and Earth Science and Technology, the University of Hawaiʻi at Mānoa. Retrieved 2007-06-07. ^ Coble, Paula G. (2007). "Marine Optical Biogeochemistry: The Chemistry of Ocean Color". Chemical Reviews. 107: 402–418. doi:10.1021/cr050350. ^ Britt, Robert Roy (October 4, 2005). "Mystery Ocean Glow Confirmed in Satellite Photos". ^ Holladay, April (November 21, 2005). "A glowing sea, courtesy of algae". USA Today. ^ "Sea's eerie glow seen from space". New Scientist. October 5, 2005. ^ Casey, Amy (August 8, 2003). "The Incredible Glowing Algae". NASA Earth Observatory. NASA. ^ Étude de la dérive à la surface sous l’effet du vent, Observation and estimation of Lagrangian, Stokes and Eulerian currents induced by wind and waves at the sea surface, F. Ardhuin, L. Marié, N. Rascle, P. Forget, and A. Roland, 2009: J. Phys. Oceanogr., vol. 39, n° 11, pp. 2820–2838. ^ Mesure de l’effet de frottement à la surface de la mer, "Tangential stress beneath wind-driven air-water interfaces", M. L. Banner and W. L. Peirson, J. Fluid Mech., vol. 364, pp. 115–145, 1998. ^ Courants mesurés près de la surface, The drift current from observations made on the bouee laboratoire, Joseph Gonella, 1971: Cahiers Océanographiques, vol. 23, pp. 1–15. ^ "Chapter 34: The Biosphere: An Introduction to Earth's Diverse Environment". Biology: Concepts & Connections. section 34.7. ^ "Dissolved Gases other than Carbon Dioxide in Seawater" (PDF). soest.hawaii.edu. Retrieved 2014-05-05. ^ "Dissolved Oxygen and Carbon Dioxide" (PDF). chem.uiuc.edu. ^ Anthoni, Floor. "Composition of seawater". Seafriends.org.nz. Retrieved 2014-05-05. ^ "12.742. Marine Chemistry. Lecture 8. Dissolved Gases and Air-sea exchange" (PDF). Retrieved 2014-05-05. ^ "5.6 Synthesis – AR4 WGI Chapter 5: Observations: Oceanic Climate Change and Sea Level". Ipcc.ch. Retrieved 2014-05-05. ^ "Evaporation minus precipitation, Latitude-Longitude, Annual mean". ERA-40 Atlas. ECMWF. Archived from the original on 2014-02-02. ^ "Ocean Stratification". Eesc.columbia.edu. Retrieved 2014-05-05. ^ Deser, C.; Alexander, M. A.; Xie, S. P.; Phillips, A. S. (2010). "Sea Surface Temperature Variability: Patterns and Mechanisms" (PDF). Annual Review of Marine Science. 2: 115–43. Bibcode:2010ARMS....2..115D. doi:10.1146/annurev-marine-120408-151453. PMID 21141660. Archived from the original (PDF) on 2014-05-14. ^ "Chapter 6 – Temperature, Salinity, and Density – Geographical Distribution of Surface Temperature and Salinity". Introduction to Physical Oceanography :. Oceanworld.tamu.edu. 2009-03-23. Retrieved 2014-05-05. ^ "Calculation of residence times in seawater of some important solutes" (PDF). gly.uga.edu. ^ Chester, Roy; Jickells, Tim (2012). Marine Geochemistry. Blackwell Publishing. pp. 225–230. ISBN 978-1-118-34907-6. ^ "Can the ocean freeze? Ocean water freezes at a lower temperature than freshwater". NOAA. Retrieved January 2, 2019. ^ a b c Chester, Roy; Jickells, Tim (2012). Marine Geochemistry. Blackwell Publishing. ISBN 978-1-118-34907-6. ^ Zacharias, Mark (2014-03-14). Marine Policy: An Introduction to Governance and International Law of the Oceans. Routledge. ISBN 9781136212475. ^ a b Platt, Jane; Bell, Brian (2014-04-03). "NASA Space Assets Detect Ocean inside Saturn Moon". NASA. Retrieved 2014-04-03. ^ Iess, L.; Stevenson, D.J. ; Parisi, M.; Hemingway, D.; et al. (4 April 2014). "The Gravity Field and Interior Structure of Enceladus". Science. 344 (6179): 78–80. Bibcode:2014Sci...344...78I. doi:10.1126/science.1250551. PMID 24700854. Retrieved 3 April 2014. ^ Dyches, Preston; Chou, Felcia (7 April 2015). "The Solar System and Beyond is Awash in Water". NASA. Retrieved 8 April 2015. ^ Wiktorowicz, Sloane J.; Ingersoll, Andrew P. (2007). "Liquid water oceans in ice giants". Icarus. 186 (2): 436–447. arXiv:astro-ph/0609723. Bibcode:2007Icar..186..436W. doi:10.1016/j.icarus.2006.09.003. ISSN 0019-1035. ^ Silvera, Isaac (2010). "Diamond: Molten under pressure" (Submitted manuscript). Nature Physics. 6 (1): 9–10. Bibcode:2010NatPh...6....9S. doi:10.1038/nphys1491. ISSN 1745-2473. ^ Clavin, Whitney (May 1, 2014). "Ganymede May Harbor 'Club Sandwich' of Oceans and Ice". NASA. Jet Propulsion Laboratory. Retrieved 2014-05-01. ^ Vance, Steve; Bouffard, Mathieu; Choukroun, Mathieu; Sotina, Christophe (12 April 2014). "Ganymede's internal structure including thermodynamics of magnesium sulfate oceans in contact with ice". Planetary and Space Science. 96: 62–70. Bibcode:2014P&SS...96...62V. doi:10.1016/j.pss.2014.03.011. Retrieved 2014-05-02. ^ McKinnon, William B.; Kirk, Randolph L. (2007). "Triton". In Lucy Ann Adams McFadden; Lucy-Ann Adams; Paul Robert Weissman; Torrence V. Johnson. Encyclopedia of the Solar System (2nd ed.). Amsterdam; Boston: Academic Press. pp. 483–502. ISBN 978-0-12-088589-3. ^ Ruiz, Javier (December 2003). "Heat flow and depth to a possible internal ocean on Triton" (Full text). Icarus. 166 (2): 436–439. Bibcode:2003Icar..166..436R. doi:10.1016/j.icarus.2003.09.009. ^ a b Hussmann, Hauke; Sohl, Frank; Spohn, Tilman (November 2006). "Subsurface oceans and deep interiors of medium-sized outer planet satellites and large trans-neptunian objects" (PDF). Icarus. 185 (1): 258–273. Bibcode:2006Icar..185..258H. doi:10.1016/j.icarus.2006.06.005. ^ McCord, Thomas B. (2005). "Ceres: Evolution and current state". Journal of Geophysical Research. 110 (E5): E05009. Bibcode:2005JGRE..11005009M. doi:10.1029/2004JE002244. ^ Castillo-Rogez, J. C.; McCord, T. B.; Davis, A. G. (2007). "Ceres: evolution and present state" (PDF). Lunar and Planetary Science. XXXVIII: 2006–2007. Retrieved 2009-06-25. ^ "The Inside Story". pluto.jhuapl.edu — NASA New Horizons mission site. Johns Hopkins University Applied Physics Laboratory. 2013. Archived from the original on 13 November 2014. Retrieved 2 August 2013. ^ Aguilar, David A. (2009-12-16). "Astronomers Find Super-Earth Using Amateur, Off-the-Shelf Technology". Harvard-Smithsonian Center for Astrophysics. Retrieved January 23, 2010. ^ Mendez Torres, Abel (2011-12-08). "Updates on Exoplanets during the First Kepler Science Conference". Planetary Habitability Laboratory at UPR Arecibo. ^ Fox, Maggie (May 16, 2007). "Hot "ice" may cover recently discovered planet". Reuters. Retrieved May 18, 2012. ^ Elkins-Tanton (2010). "Formation of Early Water Oceans on Rocky Planets". Astrophysics and Space Science. 332 (2): 359–364. arXiv:1011.2710. Bibcode:2011Ap&SS.332..359E. doi:10.1007/s10509-010-0535-3. ^ McKinnon, William B.; Kirk, Randolph L. (2007). "Triton". In Lucy Ann Adams McFadden; Lucy-Ann Adams; Paul Robert Weissman; Torrence V. Johnson. Encyclopedia of the Solar System (2nd ed.). Amsterdam; Boston: Academic Press. p. 485. ISBN 978-0-12-088589-3. ^ "Study of the ice shells and possible subsurface oceans of the Galilean satellites using laser altimeters on board the Europa and Ganymede orbiters JEO and JGO" (PDF). Retrieved 2011-10-14. ^ "Tidal heating and the long-term stability of a subsurface ocean on Enceladus" (PDF). Retrieved 2011-10-14. ^ Hinrichsen, D (2011-10-03). "The ocean planet". People Planet. 7 (2): 6–9. PMID 12349465. ^ "Irrigating Crops with Seawater". Scientific American. August 1998. ^ Schaefer, Laura; Fegley, Bruce, Jr. (2009). "Chemistry of Silicate Atmospheres of Evaporating Super-Earths". The Astrophysical Journal Letters. 703 (2): L113–L117. arXiv:0906.1204. Bibcode:2009ApJ...703L.113S. doi:10.1088/0004-637X/703/2/L113. ^ Solomatov, V. S. (2000). "Fluid Dynamics of a Terrestrial Magma Ocean" (PDF). ^ Leitner, J.J.; Lammer, H.; Odert, P.; Leitzinger, M.; et al. (2009). "Atmospheric Loss of Sub-Neptune's and Implications for Liquid Phases of Different Solvents on Their Surfaces" (PDF). EPSC Abstracts. 4. EPSC2009-542. ^ Tables 3 and 4 in Bains, William (2004). "Many Chemistries Could Be Used to Build Living Systems" (PDF). Astrobiology. ^ Atreya, S.; Egeler, P.; Baines, K. (2006). "Water-ammonia ionic ocean on Uranus and Neptune?" (PDF). Geophysical Research Abstracts. 8: 05179. Bibcode:2005AGUFM.P11A0088A. ^ Guillot, T. (1999). "A comparison of the interiors of Jupiter and Saturn" (Submitted manuscript). Planetary and Space Science. 47 (10–11): 1183–200. arXiv:astro-ph/9907402. Bibcode:1999P&SS...47.1183G. doi:10.1016/S0032-0633(99)00043-4. ^ Lang, Kenneth R. (2003). "Jupiter: a giant primitive planet". NASA. Retrieved 2007-01-10. Pope, F. 2009. From eternal darkness springs cast of angels and jellied jewels. in The Times. November 23. 2009 pp. 16–17. Wikimedia Commons has media related to Ocean. Look up ocean in Wiktionary, the free dictionary. Origins of the oceans and continents". UN Atlas of the Oceans. This page was last edited on 25 March 2019, at 20:24 (UTC).